Have you ever wanted to try Yoga, but didn't because you felt you weren't flexible enough, didn't have good balance, or the movements were too extreme? Maybe it's time you were introduced to Chair Yoga! Chair Yoga is a form of yoga practice which can be performed sitting in a chair, or standing using a chair for support. It's a good way to ease yourself into Yoga, if you have never done it before. People who work sitting at a desk for long periods of time may also find chair yoga moves beneficial as a quick way to take a refreshing little break during their day. 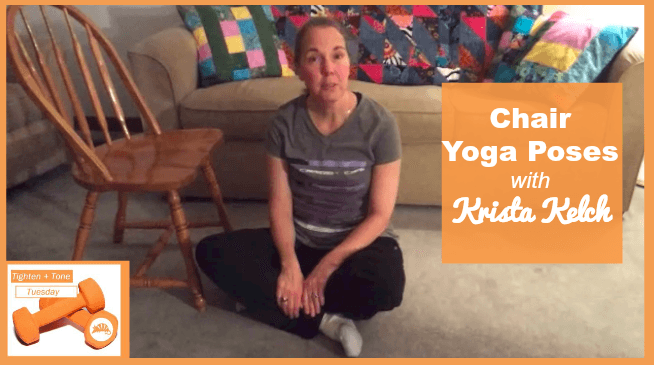 This week, Krista Kelch stops by to share a few sample chair yoga poses you might want to try to start your yoga practice or get some relief from your desk job. Want help getting started with #yoga or need a break from your #deskjob? Try these #ChairYoga poses! Begin with some deep breathing. Seated upright in the chair, put your feet flat on the floor, hands on your knees with your eyes closed. Take several deep breaths while you concentrate on relaxing your body. With your head facing forward, slowly move your head to the right as far as you can and hold for a few seconds. Then move your head to thecenter, then over to the left and hold. Repeat these moves 2 or 3 times on each side. Then face your head forward again, and try to bring your right ear down toward yourright shoulder and hold. Come back to center, and do the same on the other side. Repeat these moves 2 to 3 times each direction. Open your legs slightly and hold onto the base of the chair between your legs with your left hand. Lift your right arm overhead and stretch over to theleft side gently, as far as you can. Hold this stretch for several seconds. Bring your arm down slowly, and repeat the stretch on the other side. Do this stretch twiceon each side. Begin facing forward in your chair with your legs slightly apart, feet on the floor. Open your arms out to the side. Twist slowly to the right. In this position, bring your left hand as far as you can to the floor. Your other hand should be up in the air. While holding this pose, you can either look down at your left hand, straight ahead, or up at your right hand. Hold this pose for several seconds. Come back to the start position. You would then perform the same pose on the other side. Stand with your feet wide apart. With your chair on the right side, turn your right foot to face the chair, and your left foot the same direction about 45 degrees. Don't turn your feet quite so much if this is uncomfortable or painful for you. Lift your arms up so they are parallel to the floor. Slowly bend your upper body toward the chair until your right palm is flat on the seat of the chair and your left arm is pointed up to the sky. In this pose, either look down at your right hand, straight ahead,or up at your left hand, whatever is comfortable for you. Hold this pose for several seconds. Slowly come out of the pose by lifting your upper body until your arms are again parallel to the floor. Release your arms down gently, and bring your feet together. You would perform the same pose on the other side. Relaxation sitting on the chair is similar to how we started this session, with the feet flat on the floor, eyes closed, and deep breathing. Lie down on the floor and put the legs on the chair. In either case, once you are in position, you could start relaxing each part of your body one at a time, beginning with the feet, and working your way up to the top of the head. Now that you've learned these poses, try them out and share them with a friend who could use a chair yoga break! And if you want 1-on-1 help with your yoga or fitness routine, head to the Sign Up page to book a session with Krista! Get it now and enjoy sharing your yoga practice with your favorite kids to beat pre-holiday stress!